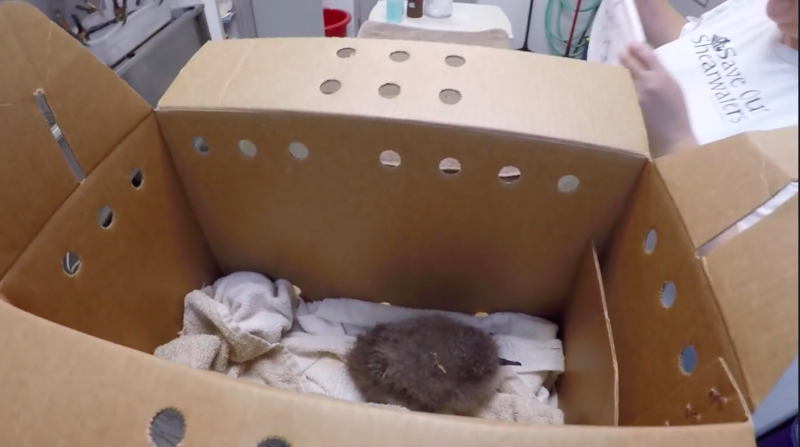 (Lihue, Kaua‘i) – A tiny Newell’s Shearwater chick, rescued from the Hono o Na Pali Natural Area Reserve on Kaua‘i, in late August, is thriving and doing well at the Save our Shearwaters (SOS) facility. The lost chick was collected by KESRP staff members, Heidi Ingram and John Hintze. They carried it up the side of a mountain to a helicopter landing zone on a remote ridge. The bird was put into a carry box and flown to Lihue where it was then taken to SOS at the Kaua‘i Humane Society. In addition to the Newell’s Shearwater, KESRP also focuses on the Hawaiian Petrel. Kaua‘i has one of the largest breeding populations of petrels in the Hawaiian archipelago. KESRP also undertakes studies on Kauai’s most enigmatic seabird, the diminutive Band-rumped Storm-petrel, which is a Candidate for Listing. Very little is known about this rare seabird, which mainly breeds in the cliffs of the Na Pali coast. The three seabird species are particularly hard to study, coming into the islands only at night and nesting in remote and steep terrain in the mountains of Kaua‘i. KESRP uses a wide range of high tech equipment and methodologies. Truck-mounted radar units are used at night to count birds as they move in and out of their breeding colonies to look at island-wide population changes over time. Sound recording devices are deployed from helicopters using grappling hooks into inaccessible areas and within managed colonies to record changes in the number of breeding birds in colonies each year. Night vision goggles are used by survey teams to count birds flying into colonies, and cameras are set at burrows to monitor predator interactions and bird behaviour. The team is also investigating a range of techniques – including lasers and bird diverters – to reduce collisions on power lines. All of this data is then used to help direct on-going management activities for this imperilled seabirds. A one-half hour television special, The Endangered Seabirds of Kaua‘i debuts on KFVE-TV (K5) tonight at 6:30 p.m., with a repeat scheduled for Sunday, Sept. 10, 2016 at 6:00 p.m. The DLNR & YOU special, supported by the Hawai‘i Tourism Authority, highlights many of the efforts and research projects underway to save Kaua‘i’s endangered seabirds. The Kauai Endangered Seabird Recovery Project is a joint project between DLNR/DOFAW and PCSU/RCUH.